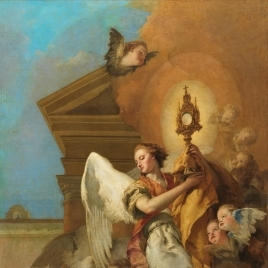 This majestic image was part of a cycle of seven altarpieces commissioned in 1767 for the new royal church of San Pascual Bailón at Aranjuez, founded by Charles III in the same year. The altarpieces comprised the entire pictorial decoration of this Alcantarine Franciscan church, which was built in an austere classical style. The subjects of the altarpieces reflected some of the most important devotional practices of the Franciscan Order: devotion to the Eucharist, to the Christ Child and to the purity of the Virgin Mary. Giambattista Tiepolo`s The Immaculate Conception, 1767-69, was placed to the left of the High Altar, with his Saint Francis receiving the stigmata, 1767-69 (Museo del Prado) as its pendant on the right, and Saint Pascual Bailón adoring a vision of the Eucharist, 1767-69 (two fragments in the Museo del Prado), on the High Altar itself. 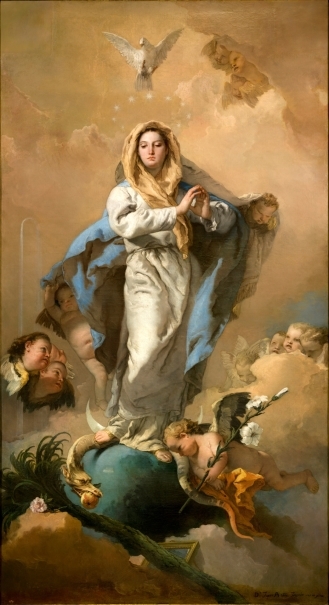 The Immaculate Conception was a cult strongly promoted by the Franciscans. Representations of this abstract idea of the purity of the Virgin Mary were conventional and familiar by the time this work was created, and paintings by Guido Reni and Bartolomé Esteban Murillo were particularly influential. 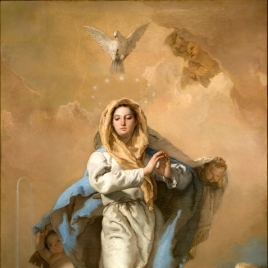 In Tiepolo`s oil sketch for the Aranjuez altarpiece the femininity and humanity of Mary are emphasised, and her delicate form is supported by angels on either side. In the final altarpiece, however, the proportions have changed so that the figure of the Virgin commands more space, and the torsion of her body is accentuated so as to endow her figure with greater energy. Mary`s qualities of splendour and gravitas are akin to those of the angel bearing the Eucharist in the Saint Pascual Bailón altarpiece, and this affinity is appropriate, if not deliberate, since the Immaculate Virgin was, in effect, the first tabernacle for Christ present in the Eucharist. The symbols in the altarpiece refer to the virtues and significance of the Virgin. She vindicates the original weakness of Eve by trampling on the serpent. The palm tree symbolises her victory and exaltation and the mirror symbolises her freedom from all stain. The crescent moon and twelve stars refer to the Apocalyptic Woman of Revelation 12:1-10, while the crescent itself is an ancient symbol of chastity. At the same time, the moon`s light derives from the sun, just as the special grace of Mary derives from the merits of Christ. The shimmering profile of an obelisk shape in the background is a further reference to traditional symbols associated with the Immaculate Conception, the Tower of David and the Tower of Ivory, with their evocations of impregnability, virginity and purity. 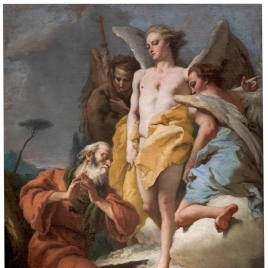 The Immaculate Conception and the other altarpieces then in San Pascual Bailón were removed to the adjoining convent in 1775, and were replaced with paintings by Anton Raphael Mengs, Francisco Bayeu y Subías and Mariano Salvador Maella. 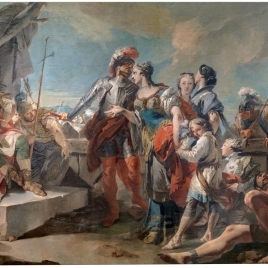 Tiepolo`s interpretation of the Franciscan themes clearly met with the approval of Charles III and Joaquín de Eleta, since the instructions for the replacement paintings insisted that the saints and sacred mysteries represented should not be changed. 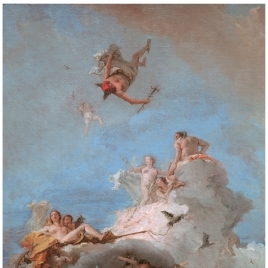 Rather, it was the freshness, modernity and naturalism of Tiepolo`s approach that was the problem - his franchezza pittorica, so admired in Venice, did not please the King and his advisers, whose eyes were attuned to the sophisticated, eclectic art of Mengs. The religious paintings of Mengs and his close followers deliberately referred to the great tradition of Bolognese classicism and were worked to a high finish, presenting a porcelain-like polished surface. In the end, this elegant and authoritative type of religious art was judged more appropriate for the restrained splendour of the King`s new church of San Pascual Bailón (W. C.: Italian Masterpieces. From Spain`s Royal Court, Museo del Prado, 2014, p. 224). Height: 281 cm. ; Width: 155 cm. Mirror: Espejo de tipo simbólico, a los pies de la Virgen. Los espejos son una variante de vidrio plano, y empezaron a fabricarse en Venecia a principios del siglo XIV alternando con los espejos metálicos al uso. Consistían en láminas planas de vidrio, cuya superficie se materializaba por el rudimentario procedimiento de aplicar sobre ella una delgada hoja de plomo o de estaño bruñidas que actuaban como capa reflectante. En el 1503, los hermanos Del Gallo desarrollaron en Venecia un procedimiento más avanzado para la fabricación de espejos que se ha empleado hasta hace no muchos años: el del azogado, consistente en recubrir la capa posterior del vidrio con una amalgama de estaño. 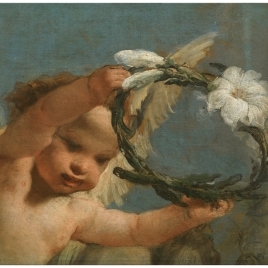 De esta manera se pudieron fabricar espejos de mayor tamaño que, a partir del siglo XVII, empiezan a aparecer en los cuadros (Fernández Navarro, J. M.; Capel del Águila, F.: El vidrio en la pintura del Museo Nacional del Prado, 2012).